I worked on the painting a bit more earlier today, and after looking at the painting, I was reminded that I needed to introduce a few more darks, and this time I wanted to add some solid darker red hues. 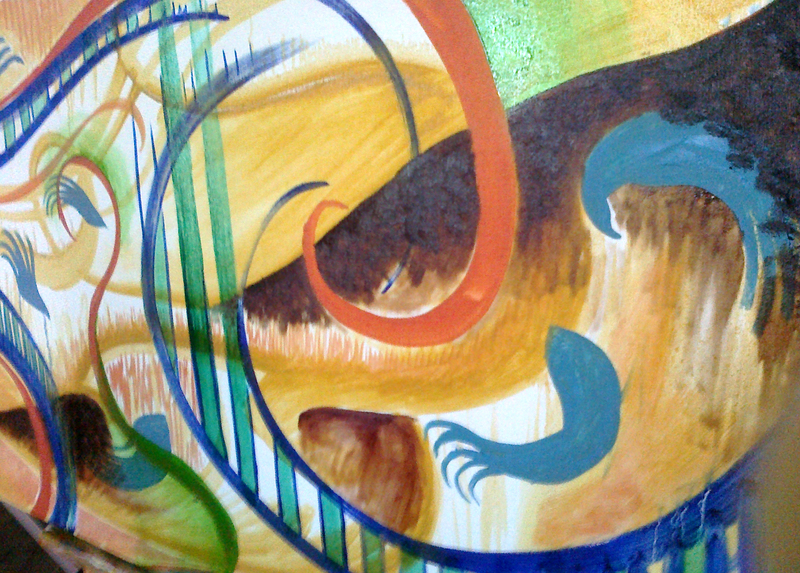 I again turned the painting around a few times while working on it to balance the colors and shapes in the overall composition of this abstract painting. Here are some photos of details from the abstract painting process of the painting that I’ve been posting progress photos lately. 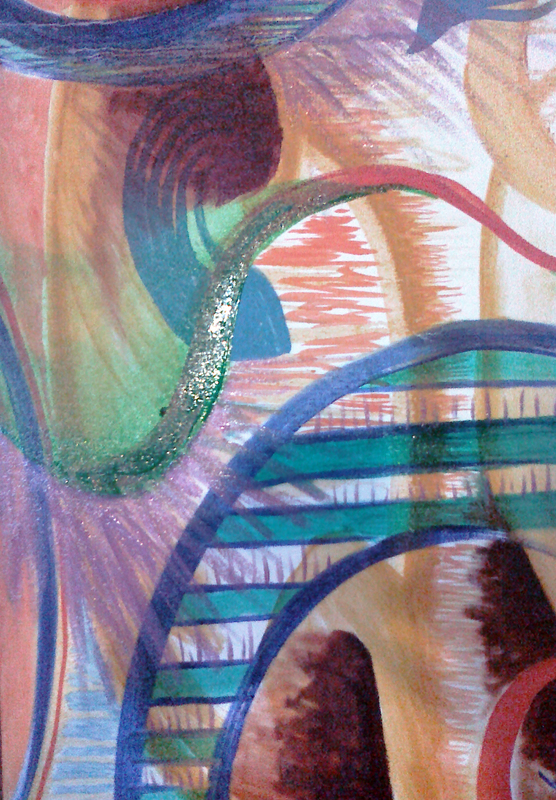 Some of the details are from earlier in the abstract painting process, some are from later in the process. After adding some darker neutrals to add some contrast and depth to the painting, I go back in with a lighter lilac mixed color and sprout some energetic bursts around some of the curves in the forms. There’s still even more to do that I have ideas to add to this painting! As I continued working on this painting, to balance out the lighter, bold colors I’ve chosen, there comes a point when I must introduce a darker neutral to balance the overall distribution of values and hues in the painting. 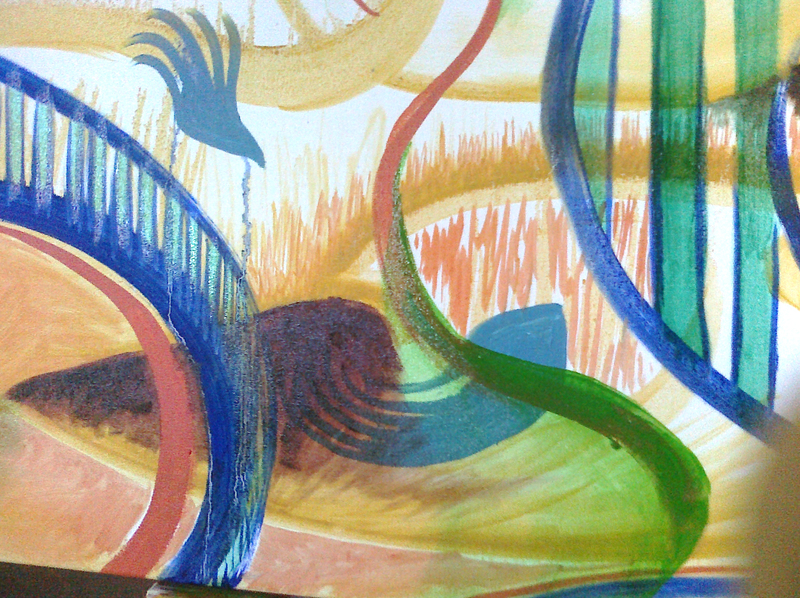 In this (Phase 7) I have added some textured darker-brown areas, lending themselves to aid in grounding the painting. 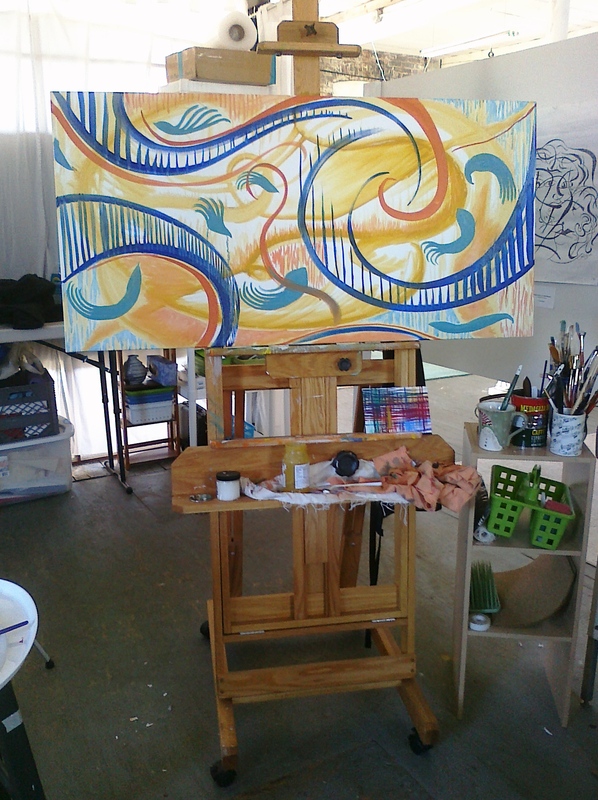 The other day, I was in my studio, painting away. Sometimes when I paint, I just dabble my brush in the paint and apply a few brustrokes every few minutes, as I stop to pause often to consider the direction that I will take the painting in. Although, to be fair, there are many times that my painting takes me somewhere else instead. Today was one of those days that my painting took me somewhere. Instead of where I thought I was taking it. This is the best time for painting…because I become so absorbed in the act of applying paint to brush and brush to canvas that I forget to breathe. Literally. I only realize that I have not breathed in a regular fashion when I finally step back from the painting and inhale a long, deep breathe, and exhale long and deeply. It’s as though my body, mind and whole being become so engaged and focused on the brushwork at hand that one breath could render my hand slightly off the line I’m creating. It might sound strange, but I am glad when I get to the place that I forget to breathe while painting. It is a signal to me that sometimes in the act of artistic creation, the act of exhaling the work I’m rendering is more crucial than inhaling the oxygen my body needs. While I work on an abstract painting, either large or small, I will rotate and flip it around to view what the visual weight and balance is of each color and series of shapes and lines. In this particular Phase 6 of this series, I have also added in some more yellow-greens that I’ve mixed with a greater proportion of liquin, so that the layers appear more translucent, to be able to view the paint layers beneath. In this phase, now I take my brush and go back and fill in some of the negative spaces created by the lines I’ve made in previous layers, lightening and darkening up some areas to suit the visual idea that I am pursuing while I am making this particular painting. 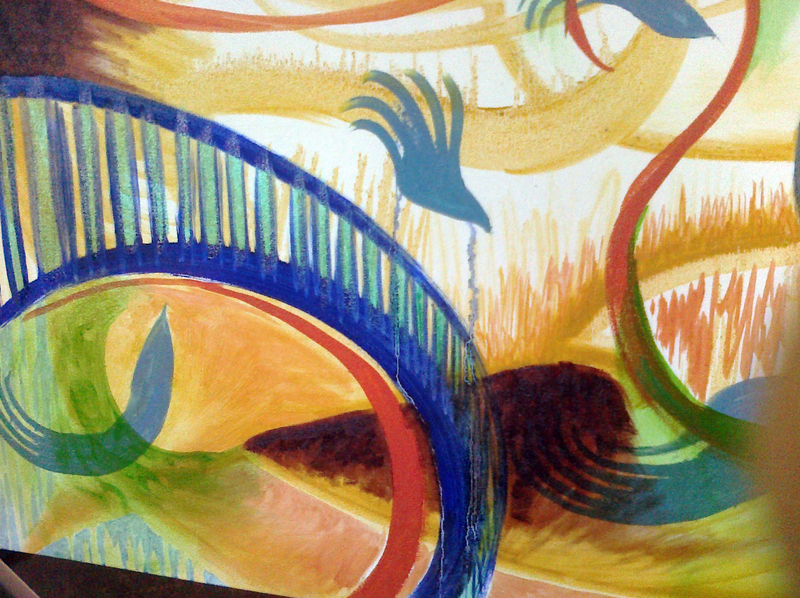 In Phase 4 of this abstract painting, I have added some warmer salmon-orange lines to balance out some of the cooler colors I had added with the blues and greens. In Phase III, I have added a third color, with small shapes and filling in a few of the negative spaces created by the lines after the paint’s watery texture caused some of the yellow to drip down the canvas. 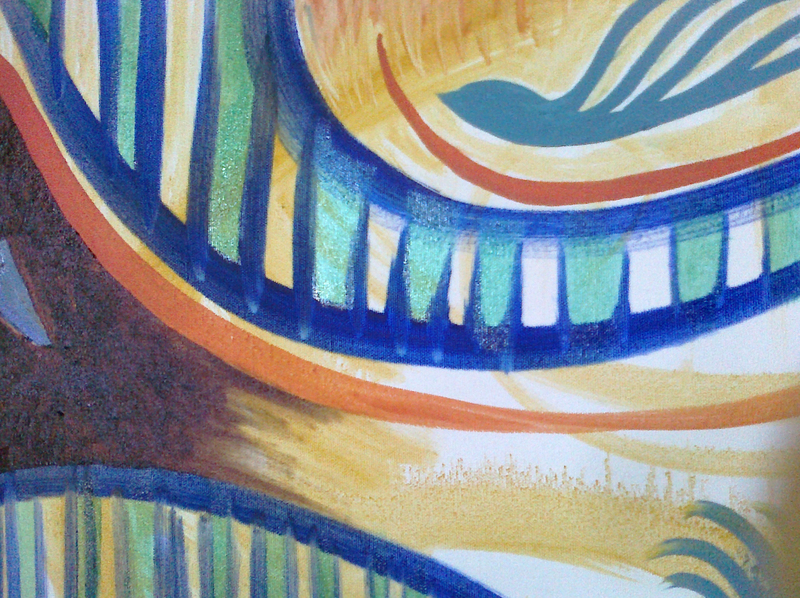 In this second layer of paint I’ve applied to the canvas, I add sweeping darker blue graphic lines. These will be part of the framework that I will wrap the rest of the elements around and through. 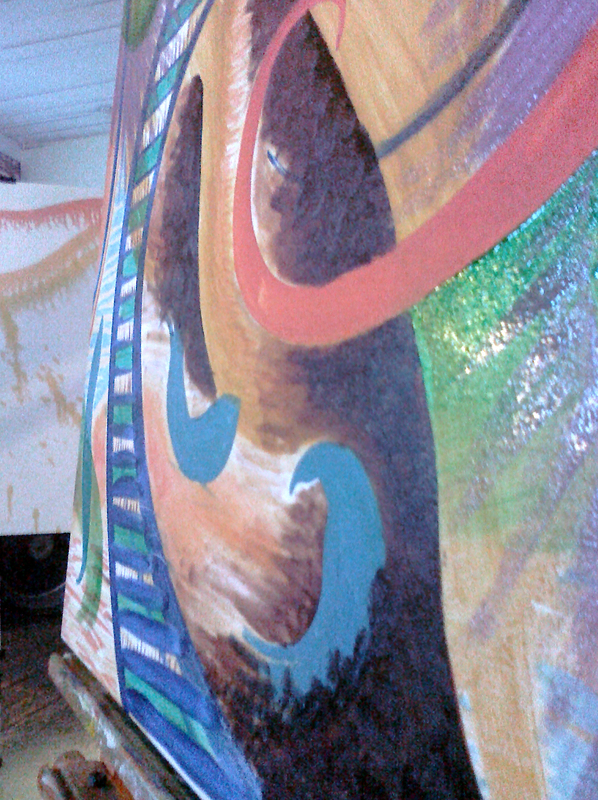 Phase I is applying the first undercoat of a semi-translucent layer of a single color. This is the first layer that will often dictate the rest of the direction of the subsequent layers of oil paint. I will often apply the next several layers of color while the original layer is still wet, so that the coats of paint will mix with one another on the canvas. Phase II posted tomorrow. This is the start of a painting. Photo progression of the layers of paint used in the creation of this painting to be posted soon.